It does actually! I actually stopped feeding her the Pangea because D3 wasn't a listed ingredient. She can stick to the wall. Just doesn't want to. I watched her a bit tonight and she just seems sassy. Could it be a possibility that she's egg bound? She'd be around two by now. Thanks again for your help. Do you see eggs in her belly? There's so much a hands-on exotics specialist vet can do that online assistance can't. D3 is often listed as cholecalciferol. Pangea's Complete Diets DO contain vitamin D3. You're welcome. I hope you find some answers. Cresties are quite common. Troubleshooting should be easier with those. I just could not see you waiting when something is amiss. 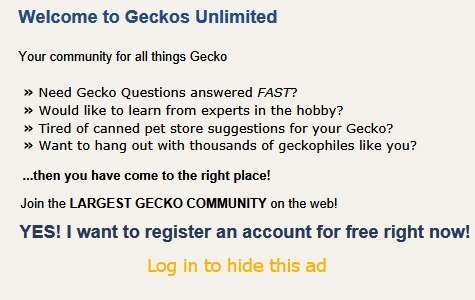 With some geckos, conscientious and knowledgeable breeders provide the best answers to difficulties. Please keep us updated. This thread may be best, since some of us are already subscribed. Last edited by Elizabeth Freer; 02-01-2018 at 07:26 AM. I took her to the vet yesterday evening. Turns out there's absolutely nothing wrong with her. Weight, calcium sacs, and size are all normal for her age, and no signs of MBD. The vet said that since it's been a bit chilly lately she could just be less active, along with her transitioning into adulthood. I got her a couple pinhead crickets on the way home (dusted them before feeding) and she actually chased them down and ate them. She seems to be a bit more active now. I'm super glad that she's healthy and thanks again for your input. You're very welcome. I think it's better to be safe rather than sorry. I'm glad she liked her crickets! Feeding crickets once in a while is always good. That's what they'd eat in the wild. What's her temperature range? She may appreciate additional heat this time of year. Days: 70-80ish *F (21.1-26.7ish *C) Sometimes I catch my crestie basking on his chill bar right beneath either a 15 watt or a 25 watt incandescent bulb. Bulb wattage depends upon the season. The temperature right there is low to mid-80s*F (26.7-28.9*C). During the days mid-May through mid-September I keep a normal 15 watt incandescent bulb over my crestie. The rest of the year it's a 25 watt bulb. That bulb provides a photoperiod, adds some heat, and sheds light on the potted sansevieria. Last edited by Elizabeth Freer; 02-02-2018 at 04:29 PM. Yeah I was very surprised that she actually ate them, she usually doesn't. Her temps right now are about 71 during the day and 68 at night. I moved her further away from the window so hopefully she'll be warmer than she was. I don't have any lighting on her but have been considering getting some, although the room she's kept in has very bright natural lighting. Since your crestie is at the low end of comfortable temps, what do you think about adding a 15 or 25 watt incandescent bulb with the maximum diameter lamp that will fit? I imagine that would be an 8.5 or a 10 inch lamp to house the bulb. A diagonal piece of bamboo all the way to the top will give your crestie a basking spot. A group of silk plants up high could do the same thing. Another method is a basking bar hung from the screen top. She's doing well. She still walks slow and doesn't jump much, I'm thinking that's just how she is, even though cresties are usually super hyper!